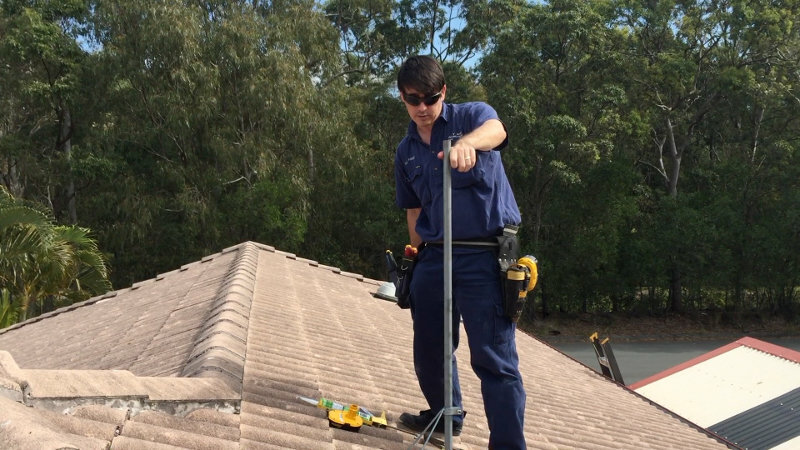 Here’s how to install a tripod TV Antenna mount on a tile roof. 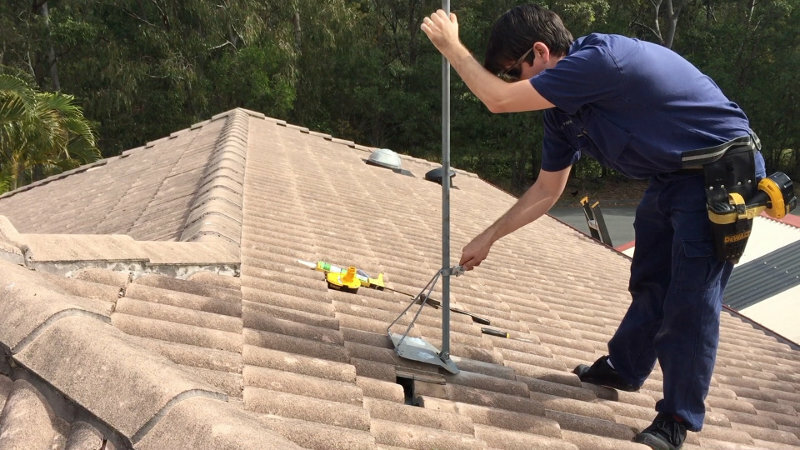 It’s one of the best ways to install an antenna for Digital TV on a tile roofed house as it allows you to get more height than a fascia pole. For information about other mount types, see the How to Mount a TV Antenna article. This video shows the process. See the detailed instructions below the video for more information. 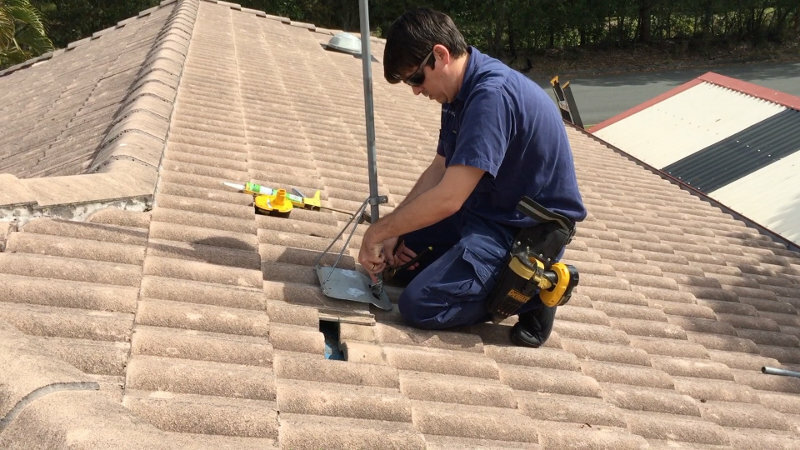 Please note this process is only suitable for typical concrete tiles in Australia. Terracotta roof tiles, for instance, cannot easily be pushed up and require special care. I always recommend mounting TV Antennas as high as possible, but there are some other considerations to think about. If possible, put the tripod mount base on a face of the roof that isn’t visible from the front of the house. They are a bit ugly if easily seen from the ground. 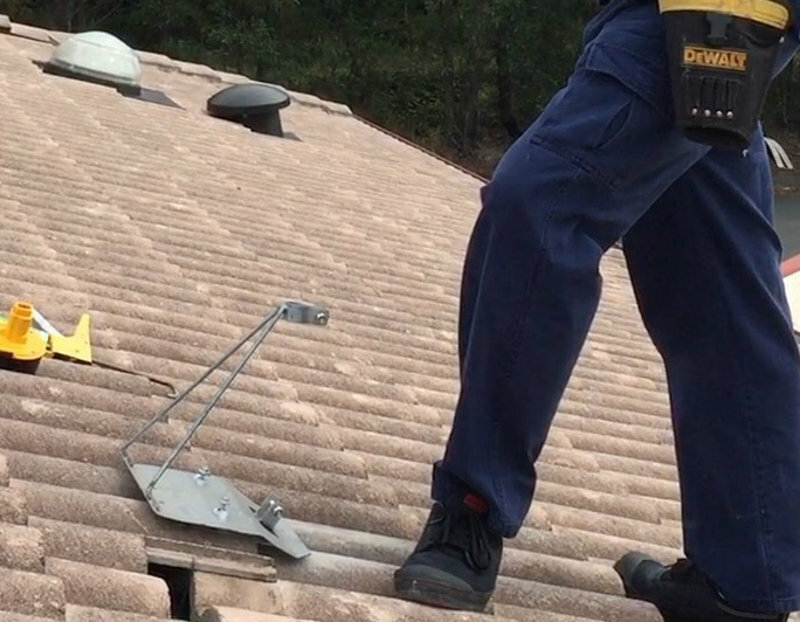 Always put the base on a tile at least three rows below the ridge cap, otherwise it may be difficult to get the cable into the roof and to replace the tile should it crack or break. I suggest checking you can lift the adjacent overlapping tile and push it up. For information on suitable tools, see my DIY Digital TV Tools article. Place the tripod base on the chosen tile. The angle fold should sit on the edge of the tile. 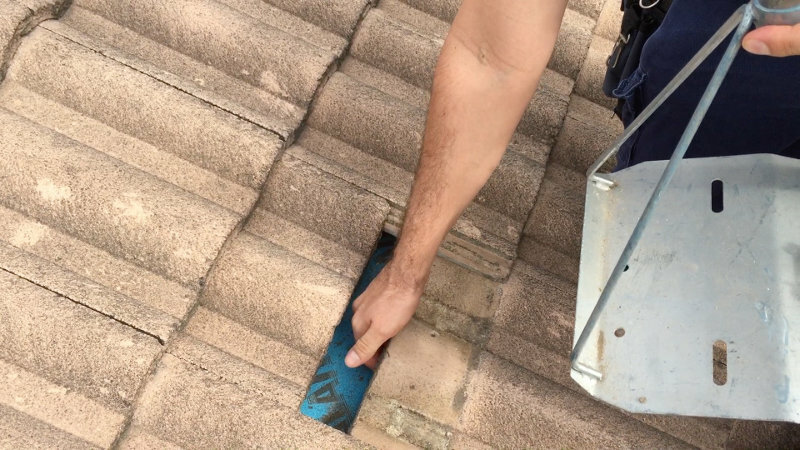 (Recommended) Kick or push back the adjacent overlapping tile to check the position and type of roof baton. Steel roof batons are narrow and harder to hit than wooden batons. Using your hand, locate where the baton is. Align the screw holes in the tripod base to where you believe the baton is. Using a masonry bit, drill holes through the tile for the screws. I recommend starting using the drill holes as a guide and then remove the tripod base while you complete drilling. I suggest doing the centre rise hole first. Do not use hammer mode, as this may crack or break the tile. Check that you have hit the baton using a screwdriver. If you are not quite in the right position you may be able to recover by driving the screw in at an angle. 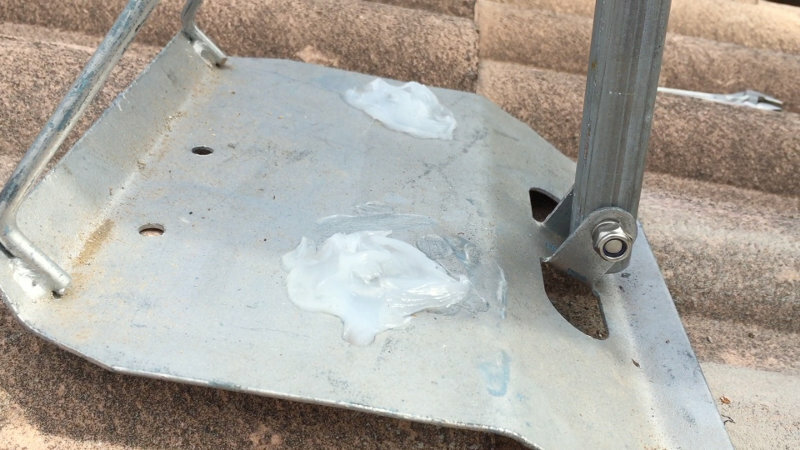 Apply roof and gutter silicon to the hole. I recommend Selleys Clear Roof and Gutter Silicon. Squirt a generous amount down the hole and then cover the area surrounding the hole on the surface of the tile. Replace the tile roof tripod base on the tile and align the screw holes. 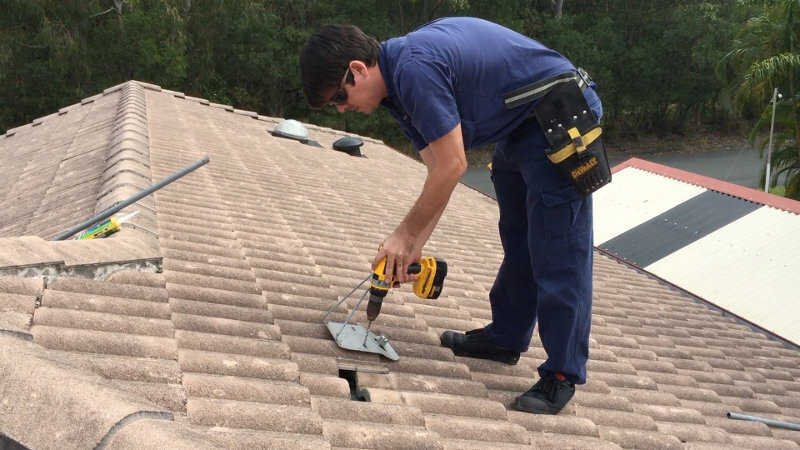 Insert two 14g 90mm or 100mm hex head roofing screws into the holes. Check they hit the baton. Using your drill’s medium torque setting and a hex head driver bit, screw the screws into the baton. Don’t go to tight, but the base should be firmly secured. Warning: Tighten the screws too much and you will crack the tile. Cover the screws with more silicon and smooth it with your finger. Put some additional silicon where the top of the tripod base meets the ridges of the tile. Loosen the tripod collar, if necessary, and insert the pole with the end with the screw hole down. Remove the base pole bolt from the base, drop the pole into place and replace the base bolt, but don’t tighten it yet. Straighten the pole to vertical, use a level if you need to. Once straightened to vertical, tighten off the collar nut. Tighten off the base pole bolt and nut. If a rubber pole end cap has been supplied put it on top of the pole. If you are using a pole taller than 1.2m you will likely need to install stay bars to stop the pole moving too much. 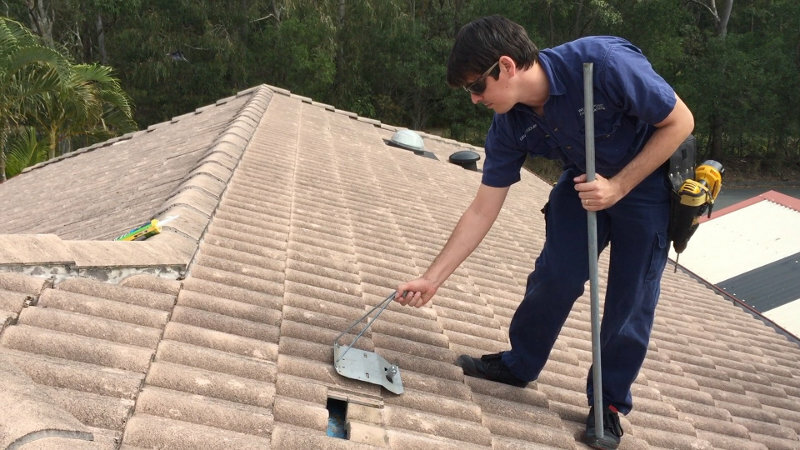 If you have flat concrete roof tiles, the procedure is largely the same, but be careful. 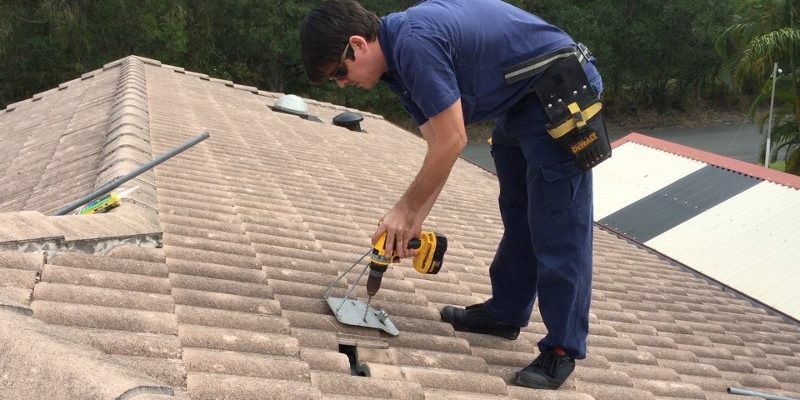 Flat tiles are far more fragile than normal ridged roof tiles. Put additional silicon where the top of the tripod mount meets the tile to stop water running under the base and to better bond it to the roof. You can use a flat tin roof tripod, but it is harder to align to the baton location and doesn’t spread the weight onto the lower tile.